The children were from “The Boys’ and Girls’ Aid Society,” a San Francisco institution for boys “not sufficiently wayward to require assignment to the reform school, and too hard to manage to be placed in family homes or orphanage.” (In 1907, two Santa Rosa kids were sent there for repeatedly stealing chickens.) Their summer destination was on the Barlow ranch outside of Sebastopol, near the current location of Taft Street Winery off of Occidental Road. Between 100 and 200 boys – and it was always only boys, some as young as seven – had been coming up here since 1902. Both Santa Rosa newspapers were enthusiastic about the program, and fluffy stories about it were also popular “evergreens” in the Bay Area dailies and regional magazines (see Sunset Magazine: “Berries and Character,” 1906). What’s not to like about reading that bad boys were being reformed by spending summers in the country? And their days spent here surely were among the happier childhood memories for the boys, who otherwise would be training at the Aid Society for a lifetime of factory or machine shop work. Then why were they always trying to escape? The Sebastopol newspaper reported there were “only a few attempts to get away” in 1910, which was apparently less than the dozen or so who tried to flee in 1908. 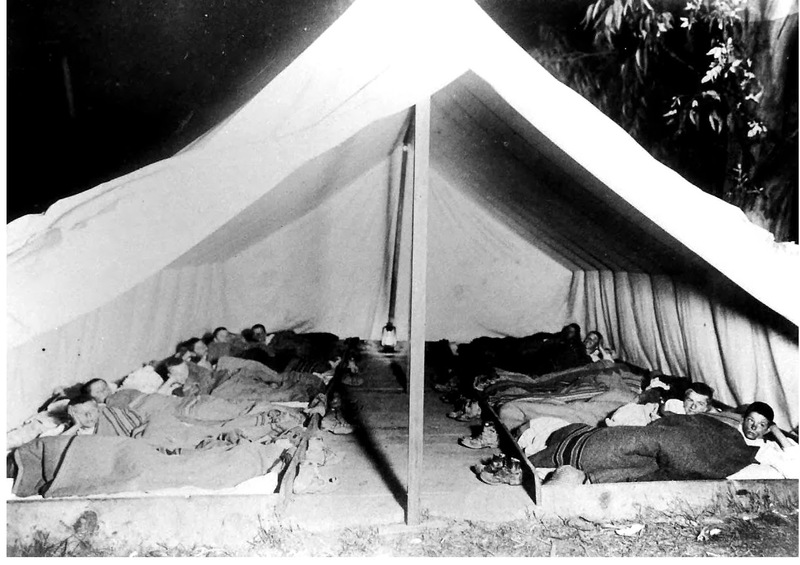 Escape was not easy, despite the campground living situation; not only did the boys have their clothes taken away from them at night and locked up, but there was a $10 bounty on runaways – the equivalent of almost a week’s wages for the average Santa Rosa household – so the community was always alert for escapees. When there were serious incidents with escapees, the local press ignored or downplayed it. In 1910 the Santa Rosa papers didn’t mention the dramatic story of 15 year-old Albert Sheuger, who escaped from the Barlow camp and made his way back to Oakland, where he committed nine burglaries in two weeks. (In one of the first robberies he discovered a suitcase filled with patent medicine, and thereafter pretended to be a door-to-door salesman if anyone answered his knock.) In 1905, the Press Democrat reported three boys gave an overweight policeman quite a workout as he chased them through the brush on the banks of Santa Rosa Creek. But no mention appeared in the PD that one of them, 14 year-old Ray Riley, escaped again and made it to a relative’s home in Santa Clara county. His family members testified in court that he showed up with his back, arms, and legs all bruised purple from allegedly being whipped with a strap following the earlier getaway. 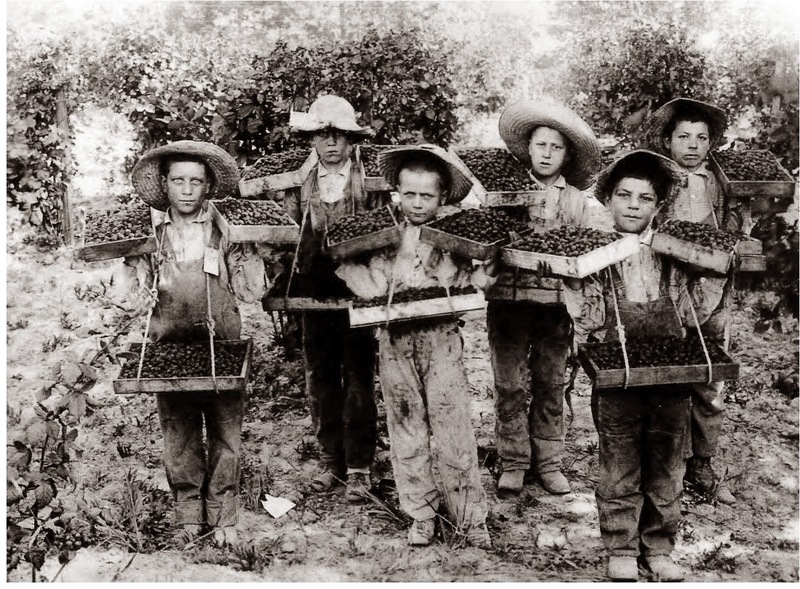 Aside from looking for escapees wearing only nightshirts or ill-fitting garments snatched off a clothesline, “the boys’ hands will be found scratched and stained from the berries,” the PD helpfully tipped off would-be bounty hunters in 1907. A close look at the photo shown at right indeed reveals their fingers were so stained as to appear dipped in paint. Which brings up a central question: How much berry picking were they doing on the Barlow ranch, anyway? But their paychecks were also docked for quite a large number of deductions. Money was first taken out for their lodging in the Barlow tents, food, transportation to and from Sonoma County plus salaries for supervisors and other adult staff. (We probably don’t have to guess who paid the $10 bounty for hauling escapees back to camp in handcuffs.) Once they were back at the Aid Society home in San Francisco, they were expected to use their earnings to pay for their own clothes, shoes and even dentistry. The state report found the boys from the Aid Society were least productive because “a number of the boys [were] feeble minded or crippled,” yet they ended the season with the most cash in their pockets. Part of the reason was because they were in the fields twice as long as the Boy Scouts or the other groups, twelve weeks compared to six or less. Also, the Barlows were less aggressive in making their child workers pay for their own food and lodging; one farmer, Lee Maddox, even charged the Boy Scouts working at his ranch for kitchen utensils and medical supplies. A third of the boys working on the Kinley farm technically ended the season in debt to the farmer, which was hopefully forgiven or billed to the Oakland church group that sent them there. To be fair, the Barlows and other growers probably would have been horrified if anyone suggested they were exploiting children or abetting the Aid Society to do same. Working outdoors in pleasant weather, even under guard, even being cheated on wages paid on the amount of fruit you pick was character-building and completely different from slaving away in a sweatshop being paid for the number of pieces of cloth you sew…right? Consider, too, this was the Progressive Era in America, when attitudes about juvenile delinquency were just starting to become less rigid. By 1910 Santa Rosa had created a “Detention Home,” so youthful offenders didn’t have to be incarcerated in jail cells next to adults. Yet at the same time, San Francisco papers reported a young man named Joe King, who had been in and out of reformatories for 13 of his 20 years, was sentenced to five years in San Quentin for burglary. The Bay Area poster child for reforming the system in 1910 was Eugene Griffin, 17 and completely illiterate. An Alameda County judge and District Attorney tried to find a way to keep him out of prison, where they were certain he would become a hardened criminal. Griffin had been sent to the Preston School of Industry at Ione (AKA San Quentin for Kids) after several minor burglaries. While attempting to escape Preston he stole a revolver, taking a shot at an instructor trying to capture him. His probation officer issued a moving statement that the juvenile justice system was broken. The retiring superintendent at the Preston School was “cruel in his punishments,” and his replacement was proposing shipping all troublemakers to San Quentin. “For my part I would rather have a boy of mine have his neck broken and die at the school than to have him sent to San Quentin. I do not believe those two methods of treatment are the only alternatives…California needs an adult reformatory.” Griffin ended up sentenced to two years at San Quentin. And some in 1910 still believed criminality was a biological problem. Rev. W. H. Scudder, a Congregationalist minister in Petaluma – and who was once the president of a rescue home operation in San Francisco – asked a doctor to consider operating on his son to remove his criminal traits. “In the east and in Europe,” reported the San Francisco Call on February 7, “several children, the victims of moral obliquity, have been operated upon very successfully, it being discovered that the trouble lay in their skulls being too small to contain their brains. This defect has been remedied by removing portions of the skull and thus allowing the brain room to develop.” Alas, there appears to be no record as to whether Reverend Scudder’s incorrigible son had the mind expanding operation. After breakfast the hundred boys gather on the play grounds and stand with uncovered heads for the flag raising. Every day the central flag floats out on the breeze and when the camp is occupied, Saturdays and Sundays, each tent has its flag up. The bugle gives the call for “colors” and the boys stand at attention. After this service they are told off in squads for the day’s work, and leave at 6:45…left at the camp is the matron and her three assistants, the bookkeeper and the cook. After dinner they have till 8 o’clock for playtime. Often they will get their day’s work done early. It is planned to so divide the squads that they will finish about the same time and this is done by sending a greater or less number of boys to a field. Saturdays are rest and play days, and Sundays are devoted to godliness and cleanliness, which is next to godliness. The games of Saturday are ninepins, baseball, football and quoits. There are four baseball nines at the camp. The boys go to the “ol’ swimmin’ hole” often during the week, but it is a part of the regular Sunday forenoon program for the boys to put on their tights and take a swim. “The water is fine,” deep, and clears rapidly. In the afternoon, Rev. William Rogers conducts the service and to this gentleman is due the credit of four years’ work every summer Sunday afternoon. At 8 o’clock in the evening comes bed time, and “taps” at 8:15. After “taps” the camp is in charge of the nightwatchman. Boys love an organization of semi-military form. When they cannot have it they will frequently steal away from home to hunt Indians, or buffalos; or to become cowboys, and the great need is recognized in “Sons of Daniel Boone” and similar boys’ leagues. It has its place in this Aid Society, and appeals to the boys, as well as enables the officers to keep complete control at all times. The boys, many of them, come to the society through the juvenile courts, more untamed than criminal — the stuff from which for want of training, criminals are made frequently but from which, with training some men of national fame for ability and unright [sic] character are made, as was a very notable case from Father Vaughn’s school in Wisconsin. Father Vaughn spent his life and a fortune, achieved as actor and platform lecturer, in support of the same work among boys from Chicago, that is done for these California boys by the Aid Society. More than one hundred of the boys who are gathering the crops of berries at the Barlow berry fields came over on an electric train Friday morning to enjoy the circus. They were accompanied by Superintendent Frank C. Turner and enjoyed a splendid day’s outing. The lads marched up Sebastopol avenue behind their drum corps and attracted much attention by their manly bearing and military precision. “The Boys and Girls Aid Society boys will break camp next Tuesday morning and go back to San Francisco that afternoon. …Mrs. Newcomb, the matron, is loved by all the children, her motherly ways making her a favorite. Many of the children on leaving write regularly to her and their letters are promptly answered by her. She is always interested in their welfare and keeps in touch with all of them.